Canyon first listed films to rent in the November ’66 edition of their News newsletter, then published the catalog separately one month later. In the book Canyon Cinema, Scott MacDonald notes that the News listed just 31 filmmakers with films. Only six of them had multiple films listed; while the rest listed just a single film each. 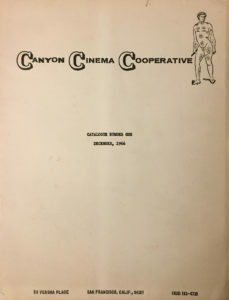 The first standalone catalogue expanded on that first listing of filmmakers, but is still a modest publication at just sixteen pages, plus the covers. The catalogue includes 45 filmmakers — some are listed as pairs — and many more filmmakers have multiple films listed. For example, Larry Jordan has eight films listed, Robert Nelson six and Bruce Baillie four. There are no film stills reproduced in the catalogue. The only illustration appears on the cover and is the front version of Canyon’s “logo” mascot, the Exothematic Man, a drawing pilfered from, according to MacDonald’s book, a nineteenth century medicine catalog.